Contact us for more details or learn more about our rooms. 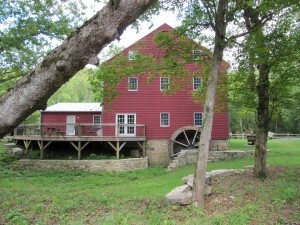 The Mill is open to the public as well as for events and overnight stays year round. Public hours are usually Saturday & Sunday 1:00– 5:00 pm unless otherwise posted at the Mill. Private tours are available by appointment – to arrange a private tour, please feel free to contact us through the website. Andrew and Robert Moody bought land for a mill in January 1811 and built a mill in 1813. In 1818 the original building burned and was replaced with the present building in 1821. The new building was placed on the original limestone foundation. The earliest tax records that indicate a mill building at this site dates back to 1832. The mill was locally called Moody’s or Moody’s Mill. Frank Grinnell bought the mill in 1864. A meadow across from the mill has seventeen springs and so the mill became known as the Spring Lea Mill. The Grinnell family owned the mill until 1948. Sometime during the 84 years that the Grinnell family owned the mill, the mill’s name changed to the Grinnell Mill. Originally, the Grinnell Mill operated as a water-powered gristmill. A large undershot wooden waterwheel powered the driveshaft that turned two sets of buhrstones. The 1913 flood damaged the waterwheel and it was replaced with a Leffel turbine in 1914. The turbine was manufactured by the Leffel Company in nearby Springfield, Ohio. Grinnell Mill also had a sawmill at one time. A limestone processor for agricultural lime functioned at the mill from 1900 through 1937.